Pray-As-You-Go, the makers of free daily podcasts on the scripture readings, and Sacred Space have teamed up to create an audio retreat for Lent that you can do at home or on the go from anywhere. 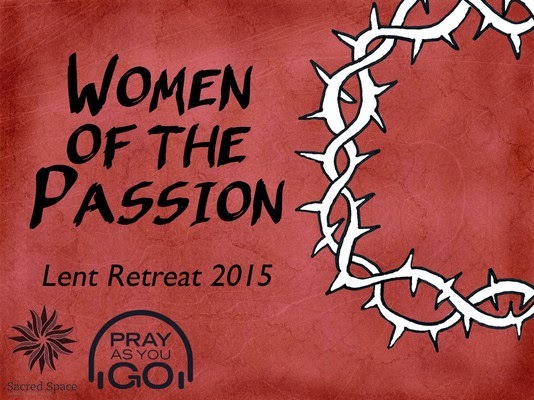 "Join us this Lent in a Retreat following the Passion, Death and Resurrection of Jesus as it was experienced by women. This retreat will focus on more than Mary, the Mother of God and Mary Magdalene, to look at peripheral characters like Pilate's wife and the maidservant at the house of the High Priest. All of these reflections will, we hope, help you to experience a closeness with Jesus in his Passion throughout the season of Lent." The weekly topics are listed HERE with short introductions and the audio tracks and reflections can be found HERE.